Our company is positioned at the apex among the most reliable Hygienic Mucus Extractor Manufacturers and Suppliers, based in India. 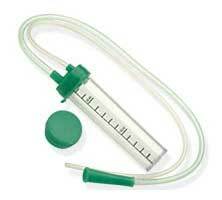 The capacity of the Mucus Extractor is 25ml and a spare cap is also provided for the sealing. Moreover, various national as well as international clients are widely placing orders for the Infant Mucus Extractor as these match the standard set at the international level and are also effective in clearance of the respiratory system. Customers are also facilitated with the timely availability of the mucus extractor and at the most affordable prices. For aspiration of secretion from or pharynx in neonatal cases ensuring free respiration. Spare cap provided for sealing container. A traumatic, soft rounded, beveled open tip.